Before you can tag an owlet, you have to ﬁnd one. 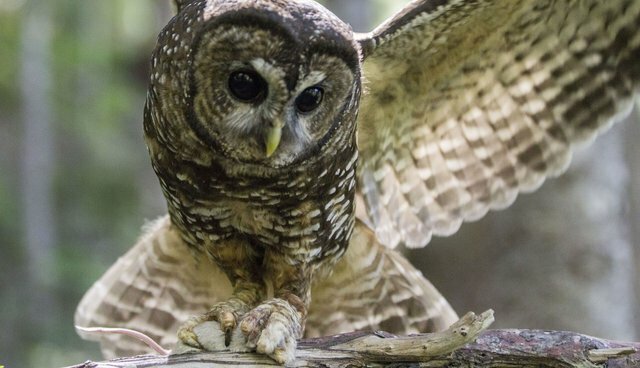 How does one go about locating a tiny, nest-bound baby owl in the midst of an enormous forest? I found out recently when, as part of my Student Conservation Association Photo Media Internship, I got to accompany a National Park Service wildlife crew on an owlet tagging expedition in Mt. Rainier National Park. Spotted owls are an endangered species here at the park so the wildlife crew tags all that they come across so they can keep track of them and see how they are doing. Spotted owls are not easy to get to. We had to trek upwards through the dense forest to ﬁnd the nests. Upon ﬁnding an adult owl, we feed it a mouse and if all goes as planned it takes it back to its nest as a meal for its owlets. We follow, and get to tagging! It was very tough going to get there, but the things I witnessed and the photos I got were completely worth it. At the second site we went to, I was lucky enough to witness an actual owlet tagging! It was amazing but also terrifying. The mama owl glared and hooted down at us the entire time!